Facts about Chawan Basu (Lotus Pond Plants). The Chawan Basu (Lotus Pond Plants) is a short lotus plant compatible for pot farming that has the blossoms, carrying the diameter, ranging from five inches to nine inches (12 to 23 cm). This pot flower transforms to rice bowl lotus. 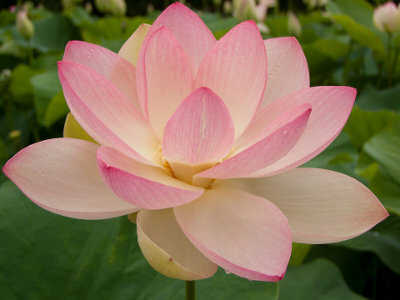 All currently available lotus varieties of Asia are cross variants of Nelumbo nucifera family. The petals of this pot flower are ivory-white in color with profound pink veins and margins. Each flower of the Chawan Basu (Lotus Pond Plants) contains a maximum of 22 petals with the dimension of the leaves, ranging from 14 inches to 17 inches (35 to 43 cm). The height of this pot flower plant ranges from two feet to four feet (.60 to 1.21 meters). The Chawan Basu (Lotus Pond Plants) grows well in kettles and tubs in the complete sun. However, the flowers may wither during the summer season. You can grow the plant in a circular, shallow pot of 20 gallon (75 liters) capacity, in two inches to eighteen inches (5 to 45 cm) of water. If the Chawan Basu (Lotus Pond Plants) is potted previously and has been frosted inside, place it out on the terrace in bursting sun. Keeping the plant there, pending the water in the pot attains the temperature of 80 F (26 cel) will get it to blossom quicker. Wait, pending leaves have commenced to grow and the temperature of the pond attains the more than 70 F (21 cel) earlier than immersing the lotus pot in the pond. This avoids the Chawan Basu (Lotus Pond Plants) from going into distress. Preferably, do not let the water assemble on the leaf surface of the Chawan Basu Lotus plant. This is because it will generate burns. Following a rain shower, tilt the leaves to let the water run from them. Naturally the leaves of the Chawan Basu Lotus plant repel water, but occasionally rain can puddle in the middle. The Lotus plant is supposed to be repotted once in three years or five years to keep up the appropriate growth. When the pot is smaller in size, there will be a frequent necessity to change the pot.